The Texan's Little Secret, is the third story in the Texas Rodeo Barons continuity series - a series written by different authors. Although connected with a continuing storyline, for the most part, this story stands on its own. Carly Baron loved her family. She loved being with them. She loved being home, but home wasn't the haven it used to be. She was living a lie. In fact, her life was a continual series of lies. Her family expected her to be the wild child. She lived up to their expectations, but that wasn't her. She told them she loved her job and living in the city. She didn't. She wanted to be home. But she couldn't stay. Every moment she was at home she risked seeing him again. Luke Nobel. Luke knew Carly was avoiding him, but he needed to prove that she didn't affect him anymore. He may have loved her once up on a time, but she hadn't trusted him. He'd moved on, gotten married, and had a little girl, Rosie. He'd lost his wife, but he knew he'd marry again. Have more children. It wouldn't be with Carly though. The attraction may be there, but he was part of a package, and Carly showed absolutely no interest in Rosie. She barely even acknowledged her. He couldn't pursue a relationship with someone who would never accept his daughter. 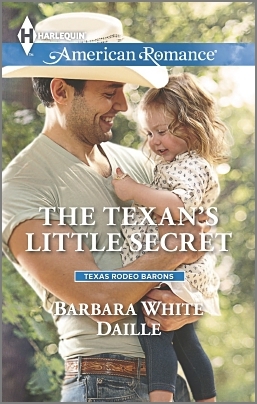 The Texan's Little Secret shows how secrets only bring heartbreak. Carly's life has been built on one secret after another. Unfortunately, as a heroine, all these lies and secrets made it difficult to identify with her. Luke, however, was the ideal hero. He could see past the secrets to the real Carly, the person she hid from everyone. He was her perfect hero - patient in allowing Carly to heal from the pain of her past. Knowing that these characters are part of a continuity series, the author did succeed at making Carly a sympathetic heroine.